Chronic kidney disease (CKD) is a condition in which the kidneys are not working properly. 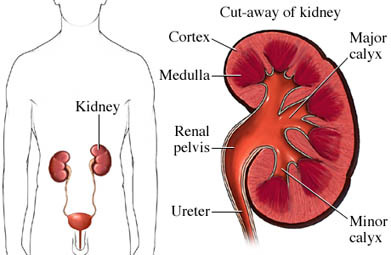 It is caused by damage to tiny structures within the kidneys called nephrons. In the early stages, CKD does not cause problems. As a result, most people don’t know they have a problem. The kidneys are bean-shaped organs in the lower back just below the rib cage. Each one is about the size of a fist. The two kidneys filter wastes from the blood and make urine. They also catch needed substances and return them to the bloodstream. If the kidneys don’t work well, wastes build up in the blood. The kidneys also keep the balance of water in the body. They release hormones that keep the bones strong, control blood pressure, and help the body make red blood cells. If your kidneys stop working, your bones may become weak, your blood pressure may go up, and your red blood cell count may drop. CKD is a progressive condition. Doctors use stages to describe how serious it is. The stage is based on the glomerular filtration rate (GFR). The two most common causes of CKD are diabetes and high blood pressure. Diabetes type 1 and type 2 occur when the body doesn’t process the sugar in the blood well. The amount of sugar in the blood increases. High blood glucose damages the kidneys, the heart, blood vessels, and eyes. High blood pressure occurs when there is high pressure within the arteries of the body. High blood pressure damages the kidneys. What are the risk factors for chronic kidney failure?What are the symptoms of chronic kidney failure?How is chronic kidney failure diagnosed?What are the treatments for chronic kidney failure?Are there screening tests for chronic kidney failure?How can I reduce my risk of chronic kidney failure?What questions should I ask my healthcare provider?Where can I get more information about chronic kidney failure? About chronic kidney disease. National Kidney Foundation website. Available at: https://www.kidney.org/atoz/content/about-chronic-kidney-disease. Updated February 15, 2017. Accessed June 15, 2018. Chronic kidney disease. Merck Manual Professional Version website. Available at: https://www.merckmanuals.com/professional/genitourinary-disorders/chronic-kidney-disease/chronic-kidney-disease. Updated March 2017. Accessed June 15, 2018. Chronic kidney disease (CKD). Family Doctor—American Academy of Family Physicians website. Available at: https://familydoctor.org/condition/chronic-kidney-disease-ckd. Updated August 9, 2017. Accessed June 15, 2018. Chronic kidney disease (CKD) in adults. EBSCO DynaMed Plus website. Available at: http://www.dynamed.com/topics/dmp~AN~T115336/Chronic-kidney-disease-CKD-in-adults . Updated May 14, 2018. Accessed June 18, 2018. What is chronic kidney disease? National Institute of Diabetes and Digestive and Kidney Diseases website. Available at: https://www.niddk.nih.gov/health-information/kidney-disease/chronic-kidney-disease-ckd/what-is-chronic-kidney-disease. Updated June 2017. Accessed June 15, 2018. 8/10/2015 DynaMed Plus Systematic Literature Surveillance http://www.dynamed.com/topics/dmp~AN~T908689/Risk-factors-for-chronic-kidney-disease : Molnar M, Mucsi I, Novak M, et al. Association of incident obstructive sleep apnoea with outcomes in a large cohort of US veterans. Thorax 2015;70(9):888-895.